Call us at 520-269-2542 if you have questions or to place your order direct! 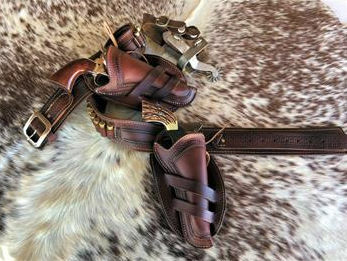 Cochise Leather Company is the home of custom handmade western gunbelts and holsters, gun holsters, western lined gun belt with holster sets, shoulder holsters, rifle scabbards, gun belts, ranger belts and hand braided horsehair belts. 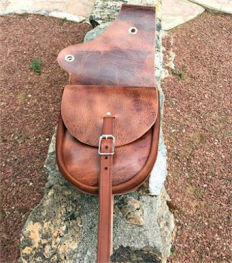 For the working cowboy, western pleasure and rodeo riders we make western saddlebags, leather chinks, spur straps, western leather chaps, leather pommel bags with holster, and more! The quality construction of our western leather goods can stand up to the everyday hard use that can be required of all of our products and our Old West Badges are made in our leather shop by hand. Exceptional quality and proudly Made in the USA! Our period authentic western leather gun holsters, western leather gunbelts, western leather holster, western gun belt and holster sets come in a variety of styles and designs. See our Old West Era western leather gun holster designs that include variations of the Slim Jim, Mexican Loop Variations, The Drifter and many more. We also have western movie era gun belts and western holsters such as the Buscadero rigs, The Duke, The Paladin, Johnny Ringo, Butch Cassidy, Open Range and many more worn by our favorite western movie stars. Our products are authentic in design and can be used in Old West stage shows, re-enactments, and western movie productions. Looking for a Wild Bunch Action Shooting rig? We have two different designs for SASS enthusiasts. David LaFlair personally makes every item from the highest quality leather to your custom order so it will be exactly as you want it. If you would like to have something made that is not on our website please contact us. As makers of custom handmade western leather goods David creates many custom items! Everything we sell in made in Cochise, Arizona and we're located just minutes from the old west town of Tombstone. We proudly use Wickett & Craig leather who tannery is located in Pennsylvania. Founded in 1867, they are a world re-known vegetable tannery. Veg-tanning is a natural, eco-friendly process that produces durable leather recognized for their depth of color and rich pantina. Cochise Leather is proud of the quality of our product and we believe that quality and value go hand in hand. We do not charge extra for border tooling if it's an option on a product, rifle scabbards come with the straps shown nor is there an additional charge for the lining on our lined western gunbelts and holsters. Cochise Leather does not have a store front; we sell online only via a secure shopping cart or you can phone your order in by calling 520-269-2542. Selling directly to you without storefront overhead enable us to keep our prices low and pass the savings on to you. 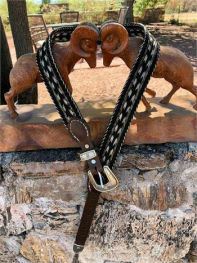 Most of our products are custom made in the USA by David LaFlair in Cochise, Arizona. A long standing SASS (AKA Dull Knife Dave #37361) and CMSA member he will make sure your items meet the standards required by these organizations. If you have questions about a product David extends the invitation to you to talk to him personally during our regular business hours by calling 520-686-2829. Customer satisfaction along with the quality of his product is his #1 priority! We take extreme care in the making of all our products, our reputation depends on it!! Have you ever wondered about the history of gun leather and other types of leather goods used in the "old west"? Read all about it on our history page for Western Gun Leather. And read about the history of other leather items on our Western Leather Products History page. These pages give a brief but thorough history of leather from medieval times through today.